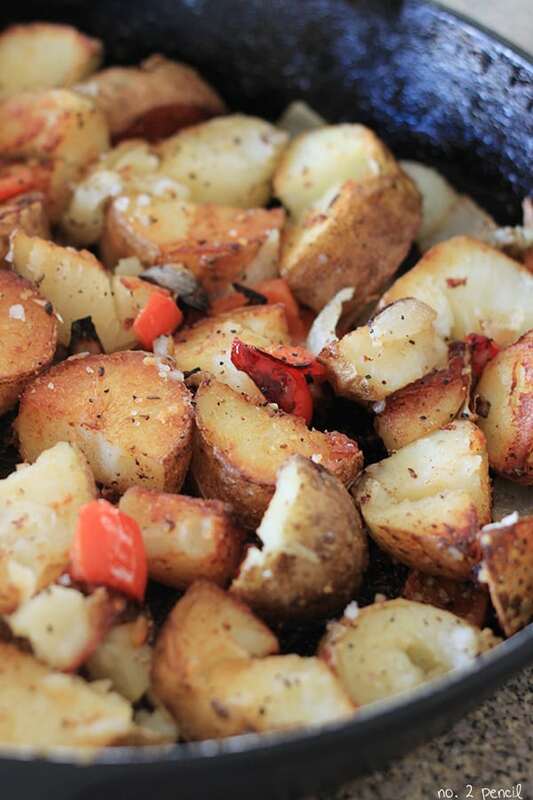 These Skillet Home Fries are the perfect breakfast potatoes. Crispy and golden on the outside, tender and fluffy on the inside, these breakfast potatoes are better than restaurant potatoes. The secret to these home fries is starting with a baked potato. By baking the potato first, you are pre-cooking it, and just giving it the golden, crispy exterior in the pan. No more half cooked breakfast potatoes! 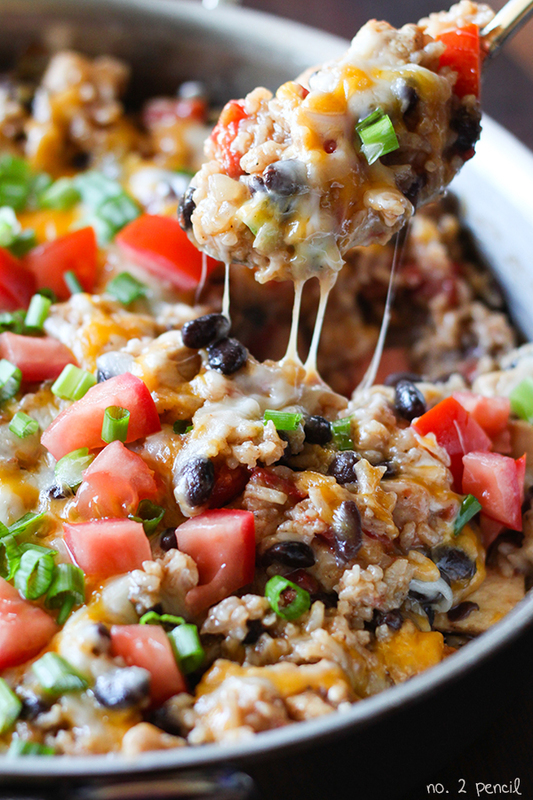 If you have leftover baked potatoes, they are perfect for this recipe. If not, I give instructions for cooking the potatoes in the microwave in the recipe. Once the potatoes are cooked, melt the butter in a large skillet. 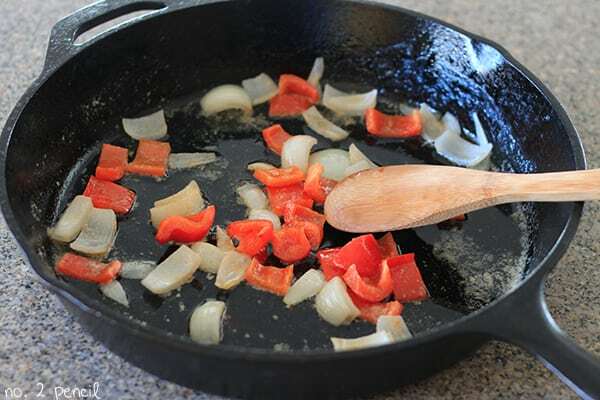 Sauté large chunks of onion and red bell peppers until they start to soften. 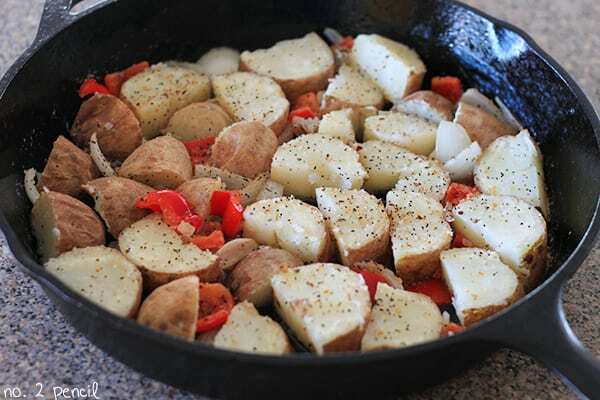 Cut potatoes into large chunks and place in pan, cut side down. Let potatoes cook over medium high heat until golden color starts to develop. Use a pair of tongs to carefully turn the potatoes in the pan. Once you have turned to potatoes a few times, you have these perfectly golden home fries! They are truly so delicious and the onions and bell peppers are delicious too. 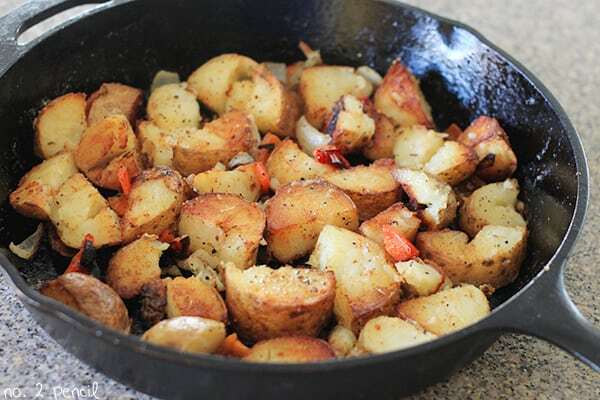 So there you go, skillet home fries so good, you don’t need ketchup. Scrub potatoes clean and pat dry. Prick potatoes several times with a fork and microwave for 10-15 minutes, or until tender. Flip potatoes every 5 minutes until cooked through. Remove potatoes and let cool. Dice onions and bell peppers into large bite sized pieces. Melt butter over medium heat and sauté onions and bell peppers until they start to soften, 3-5 minutes. Dice cooked potatoes into large 2 inch pieces by cutting potatoes long ways, then cutting each half into quarters. A serrated knife will help cut through the potato skins. Turn skillet up to medium high and place potatoes cut side down. Sprinkle potatoes with 2 teaspoons of all-purpose steak seasoning, more or less to taste. Let potatoes cook until golden brown, a few minutes on each side. Use a pair of tongs to carefully turn the potatoes as they cook. What a wonderful, easy trick for breakfast! I love this idea, will be making them this weekend 🙂 thanks again! These look and sound so YUMMY!!! 🙂 I seriously want to eat EVERY meal out your house!! I made these tonight with some honey mustard chicken strips. They were amazing and easy! I hate eating these kind of potatoes when the potatoes are still hard and the peppers start to burn, but baking the potatoes beforehand in this recipe solves that! I’m super glad I made enough for breakfast tomorrow morning as well. Looking forward to having these again, definitely a favorite!